Colin is back at Bishop! The Club is delighted to confirm that Colin Myers has joined the Club as Assistant to Manager Steve Riley. Colin is returning to the Club where he was previously Manager from 2009 to 2013. Fans will remember that when Colin joined the Club in February 2009 we were 12 points adrift from the 2nd bottom placed team in the 1st Division and he remarkably guided us to eventual safety. The Club progressed year on year with Colin at the helm culminating in us winning the Durham FA Challenge Cup in season 2012 / 2013 and finishing in 6th place our highest Northern League position since 1987. 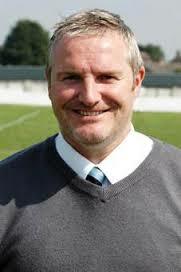 Colin began his management career as Assistant Manager at Brandon United winning the Northern League title in 2003. He then joined Jarrow Roofing as joint Manager leading them to the semi-final of the FA Vase in 2005 before becoming Assistant Manager at Shildon AFC helping them to the Northern League Cup Final in 2007. In 2013, following his spell as Manager at Bishop, Colin joined Blyth Spartans of the Northern Premier League as Assistant Manager reaching the final of the Northumberland Senior Cup at St James Park and, that season, the Club just missed out on the Premier Division play offs. The following season saw Blyth achieve that fantastic run in the FA Cup reaching the 3rd Round Proper before going out to Birmingham City 3-2 at Croft Park after leading the championship side 2-0 at half time. Blyth also reached their second successive Northumberland Senior Cup final beating Morpeth Town 2-0. After 2 successful years at Blyth as Assistant Manager Colin left to take the Manager’s job at Consett where he stayed for a year. Manager Steve Riley said today ‘I am delighted Colin is bringing his extensive non-league football experience and coaching skills to Bishop to support me and the team in our aim to challenge at the top of the Northern League this coming season’. Colin said ‘I am looking forward to get back into football at a Club where I enjoyed my time previously and had a good rapport with the fans and along with Steve I am ambitious to achieve success for the Club’.